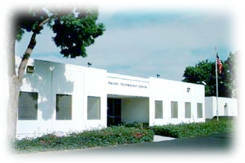 The Pacfic Technolgy Center is a small business greenhouse located in Goleta, California, just north of Santa Barbara. Occupying the former facilities of General Research Corporation, a Strategic Defense Initiative contractor, this 70,000 square foot complex has been completely remodeled and upgraded with high speed networking services. Uniquely outfitted in Santa Barbara with OC-12 and OC48 fiber feeds from three different carriers â€” Cox Communications, Time Warner, and Verison â€” the PTC can provide virtually any level of Internet and WAN bandwidth. Tenants enjoy the use of BeckNet's own Internet service delivered over secure encrypted Ethernet, or can procure services directly from upstream providers. The building features an open cabling system that simplifies network adds, drops, and changes. A two-story Secure Classified Information Facility (SCIF) vault houses all telecommunications equipment, providing exceptional physical security for tenant equipment. Digital access controls and video monitoring round out the security measures. Cox operates a Marconi-based OC-12 SONET node, while Time Warner hosts both OC-12 and OC-48 SONET via Cisco ONS gear, which lets it deliver Gigabit Ethernet. Verizon supplies 2,000 voice ports over its Fujitsu FLM-600 SONET terminal. BeckNet manages all network services in the building, and provides 24x7 support for tenants.